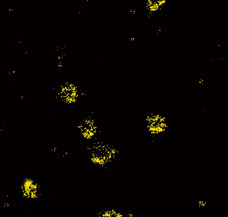 N-STORM utilizes high accuracy localization information for thousands of individual fluorophores present in a field of view to create breathtaking “super-resolution” images, exhibiting spatial resolution that is 10 times greater than conventional optical microscopes. 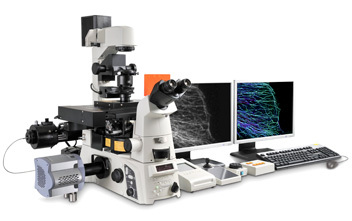 In addition to lateral super-resolution, N-STORM utilizes proprietary methods to achieve a tenfold enhancement in axial resolution, effectively providing 3D information at a nanoscopic scale. 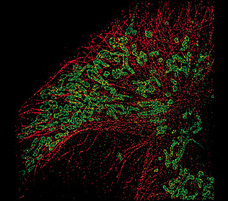 Multi-color super-resolution imaging can be carried out using either tandem dye pairs that combine “activator” and “reporter” probes or standard secondary antibodies that are commercially available for continuous activation imaging. 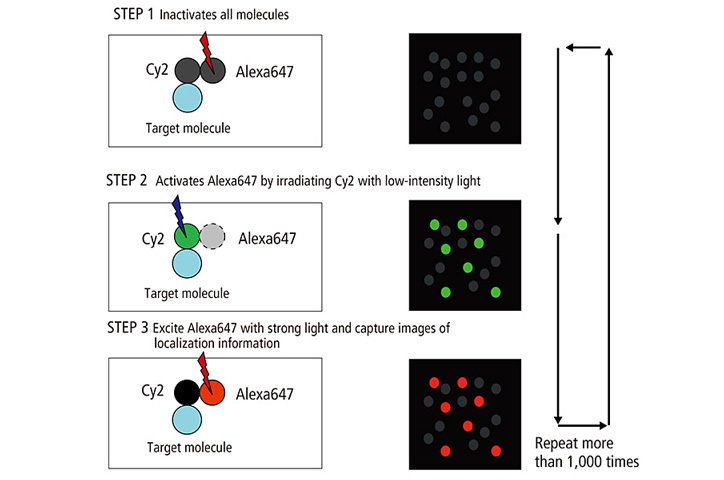 This flexibility allows users to easily gain critical insights into the localization and interaction properties of multiple proteins at the molecular level. 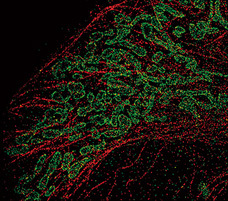 Dual color STORM image of microtubule (Alexa405-Alexa647) and mitochondria (Cy3-Alexa647) in a mammalian cell. N-STORM uses stochastic activation of relatively small numbers of fluorophores using very low-intensity light. 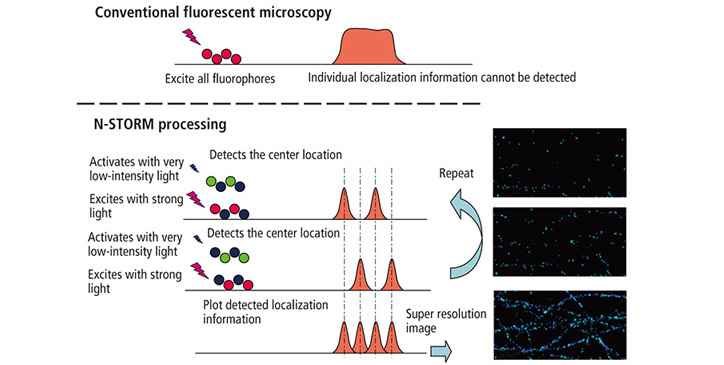 This random stochastic “activation” of fluorophores allows temporal separation of individual molecules, enabling high precision Gaussian fitting of each fluorophore image in XY. By utilizing special 3D-STORM optics, N-STORM can also localize individual molecules along the Z-axis with high precision. 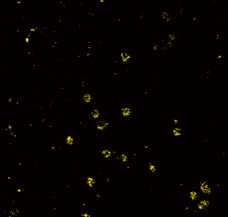 Computationally combining molecular coordinates in three dimensions results in super-resolution 3D images of the nanoscopic world. 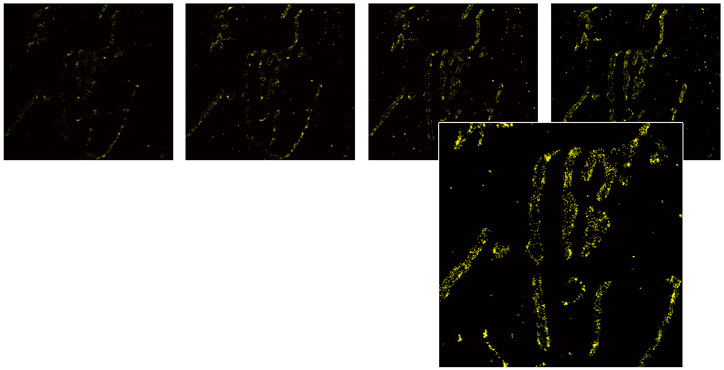 N-STORM uses dedicated fluorescent dye pairs containing an "activator" (relatively short wavelength excitation) and a "reporter" (relatively long wavelength excitation), which enables various color combinations, facilitating true multi-channel super resolution. N-STORM can also be carried out using conventional single-dye conjugated antibodies for continuous activation imaging. A dye for N-STORM consists of a shorter-wavelength dye for activation and a longer-wavelength dye for image capturing. Creation of three-color super-resolution images is possible with multiple dye-pairs. 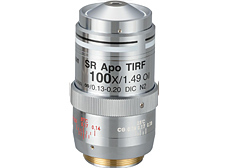 The SR (Super Resolution) objective has been designed for new applications that break the diffraction barrier.